Everyone loves a one dish dinner and especially one that can be ready quick! This takes less than 30 minutes for a delicious meat and potatoes comfort dish that serves 4. Heat oil in a high sided skillet. Brown sausage on all sides for about 5 minutes. Add potatoes, onion, salt and pepper. Cover and cook 10 minutes. Remove sausage and cut into 1/2″ pieces. Add the sausage back to the pan. Add the tomato and herbs. Stir to combine everything. Keep the dish moving until it’s heated through. Dish up and enjoy! Start up a batch of my famous pasta sauce. While that is cooking, get your sausages in a pan with olive oil and cook, turning often, until they reach 170°. While the sausages are cooking and the pasta sauce is cooking, don’t forget to stir the sauce, go ahead and cook up your pasta. When the sausage is done, transfer to a cutting board and slice into roughly 1/2″ pieces. When the pasta is done, drain and set aside. When your pasta sauce is done, it’s time to dish up. 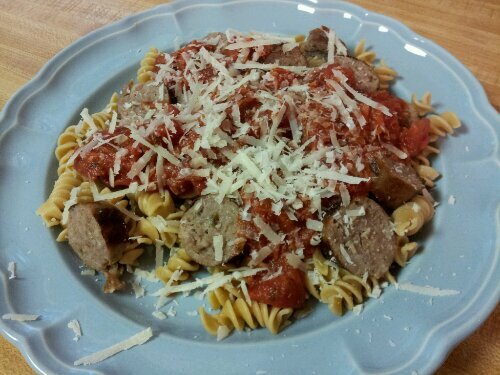 On a plate layer the pasta, sausage and pasta sauce. Then top with however much Parmesan cheese you like. Heat olive oil in skillet (one with high sides). Brown sausage. Pour 3/4 cup of water into pan and cover for about 10 minutes. Meanwhile, cook gnocchi according to package. Once sausage is cooked (remove to cut if using links then return to pan), add tomatoes, gnocchi, basil and garlic. Stir to combine and make sure all is heated through. Dish up and top with Parmesan cheese.